Root canal therapy is performed most commonly on fractured (broken) teeth or discolored teeth that are suffering from pulpitis. Root canal can be performed on dogs or cats. Root canal therapy can be performed on most teeth but is commonly performed on the large, functional teeth in the mouth. Teeth that are used for picking up items or are important for chewing are termed functional teeth. Functional teeth include the canine teeth (the large pointed teeth toward the front of the mouth), the upper 4th premolars (the largest teeth on the top of the mouth), and the lower 1st molars (the largest teeth on the bottom of the mouth). These are the teeth in the mouth that we always try to save if possible. The tooth is comprised of three main layers: the outer enamel, the middle dentin, and the inner pulp. The inner pulp canal contains living dental tissue made up of arteries, veins, lymphatics, connective tissues, and nerves. When the tooth is affected by fracture or pulpitis, it is the pulp that can be painful or become infected. Essentially, root canal therapy allows salvage of the tooth by removing the affected inner pulp in a sterile manner. The pulp canal is then cleansed and filled in with dental materials. A final hard layer of composite (the white material that is often used for fillings in your own mouth) is placed on the tooth to provide a hard, protective outer layer. After the procedure, the tooth can once again be used for chewing and picking up items. Click here for a more detailed description of the procedure. The Benefits of Root Canal Versus Extraction. When a tooth is compromised by fracture or pulpitis, root canal or extraction are often the only treatment options. Briefly, the essence of a root canal procedure is to convert a compromised tooth into a noninfectious, pain-free, functional tooth. With extraction, the affected tooth is completely removed. Root canal therapy is very successful in pets, approaching 95-100% for the life of the pet! Is a crown or cap necessary? When a root canal is performed on a human patient, a large part of the tooth has to be removed. Therefore, crowns or caps are commonly placed on the human tooth after the procedure. When root canal therapy is performed on dogs or cats, the tooth usually does not need a crown since the opening made to perform the root canal is very small. In certain cases, metal crown placement is considered to provide additional protection to teeth that have root canals. 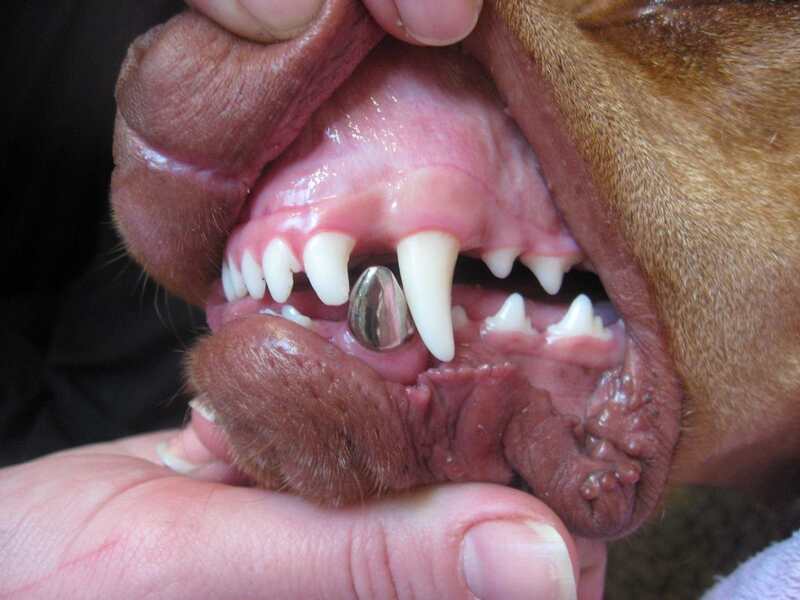 This is especially true in police dogs or other working dogs whose teeth are exposed to large chewing forces. We also consider placing a crown in dogs with a history of extensive chewing behavior or when a large part of the tooth has already been broken away. How do I know if my pet's tooth can receive root canal therapy? The majority of teeth that are fractured or have pulpitis can receive root canal therapy. 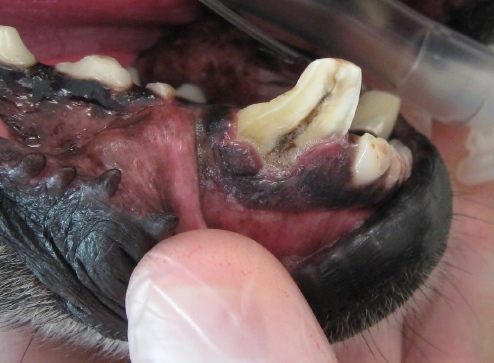 Even teeth with abscesses can often be saved. 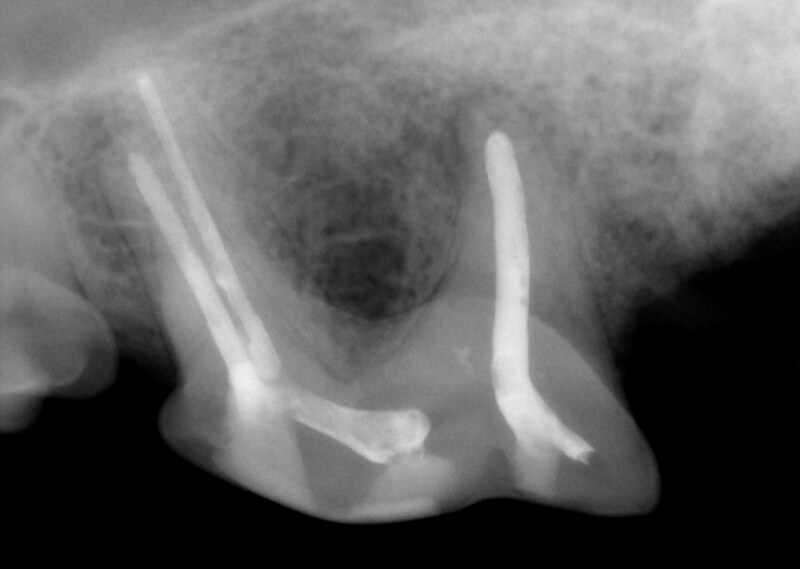 Occasionally, teeth with advanced disease are not good candidates for root canal therapy. A combination of detailed visual examination along with x-rays of the tooth will provide the information necessary to decide whether root canal therapy can be performed.